Put the bulgar, water and half the milk in a pan, bring to the boil, reduce the heat and simmer, uncovered, for 10-15 minutes. Cover and leave to stand for 15 minutes. Meanwhile, make the almond milk: pour the boiling water over the almonds, leave to stand for 15 minutes, then strain. Discard the soaked almonds. Add the rest of the milk, the almond milk and the dried fruit to the bulgar. Bring to the boil. Lower the heat and add the egg yolks and saffron, stirring. Don't boil. Stir in the sugar, then remove from the heat. 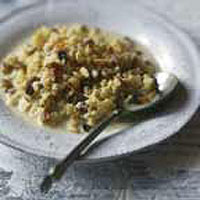 Leave to stand for a few minutes, then serve, garnished with pine nuts. For an alcoholic version, soak the fruit in the rum for 1 hour before cooking. This recipe was first published in Sun Feb 01 00:00:00 GMT 2004.